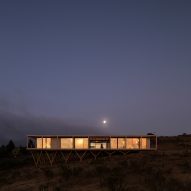 The Dock House is located in the town of Pichicuy in Chile's Valparaíso region – a mountainous and coastal area about 180 kilometres from Santiago. 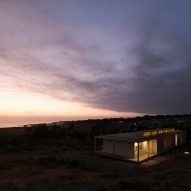 Built on a sloped site dotted with shrubs, the 150-square-metre residence is a short walk from the beach and the Pacific Ocean. 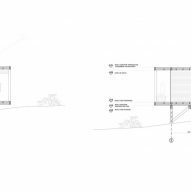 For this facade, the team used a mix of solid walls, screens, and recessed areas in response to environmental conditions. Stretching the length of the exterior is a pergola that helps reduce heat gain without blocking all sunlight. 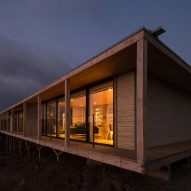 "On the northeast, the perimeters are designed to respect the privacy of the site, as well as the proper utilisation of natural light," the studio said. 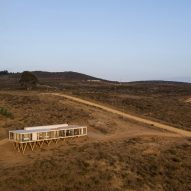 Just beyond the northeast facade is a terrace with a circular fire pit. 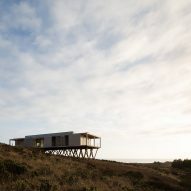 The cabin and surrounding hills help shield the terrace from wind. 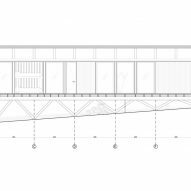 Inside, the dwelling is organised into two zones separated by a wooden terrace topped with a slatted canopy. Adjacent to the home's main entrance is the main living area, which consists of an open-plan lounge, kitchen and dining area. 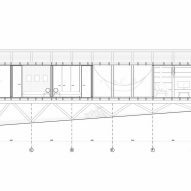 The other zone contains three bedrooms, two bathrooms and a nook with bunkbeds. Interior spaces are dominated by honey-toned wood, helping establish a warm and cosy ambiance. 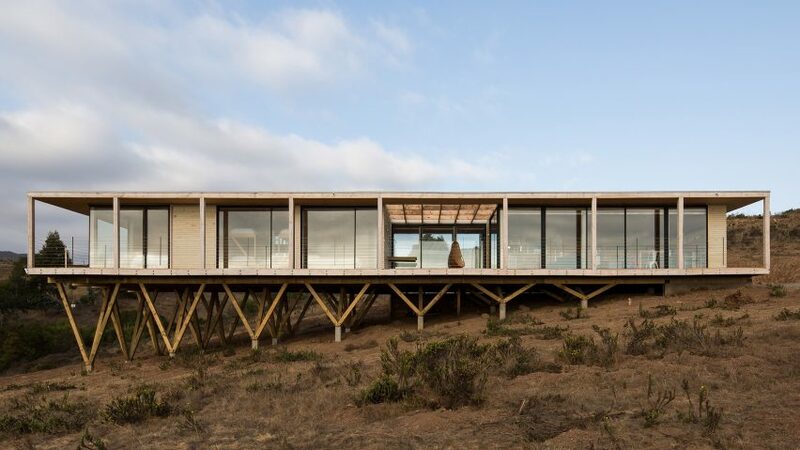 Featuring scenic landscapes, the Valparaíso region is a popular spot for vacation homes. 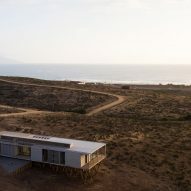 Other projects in the area include a pine-clad holiday dwelling by Mobil Arquitecto, a blackened wooden dwelling by architect Gonzalo Iturriaga, and a low-cost seaside complex by architects Alejandro Soffia and Gabriel Rudolphy. Photography is by Nicolás Saieh, unless stated otherwise.